Homeland's Claire Danes and Louis C.K. 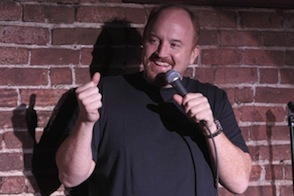 of FX's Louie. Showtime's Homeland and FX's Louie topped honorees with two trophies apiece at Saturday night's 28th annual Television Critics Association awards in Beverly Hills. But neither program was named program of the year. HBO's Game of Thrones instead prevailed while AMC's Breaking Bad beat out Homeland for "Outstanding Achievement in Drama." Breaking Bad star Bryan Cranston hosted the ceremony. ***CBS has given Unforgettable a reprieve and will return the mind-bending "procedural" crime drama next summer. "We had very strong research on the show," CBS entertainment president told TV critics during the network's portion of the TCA press tour. "So we did not want to let it go. We saw this as a window of opportunity to put the show on for next season, and we jumped on it." Unforgettable, which premiered last fall on CBS, stars Poppy Montgomery and Dylan Walsh. Thirteen episodes have been ordered. ***Actress Sarah Jones has rebounded quickly from Fox's cancellation of Alcatraz. She'll be a series regular on CBS' new Vegas, starting with the second episode this fall. Alcatraz fans were left hanging, with Jones' detective character in critical condition in what turned out to be the final episode of Alcatraz. On Vegas, she'll play a Chicago mobster's daughter named Mia Rizzo. Her assignment in Sin City is running a scam from a casino "count room." ***The CW announced Monday that the three-part web series Dr. Horrible's Sing-Along Blog, will make its TV debut on Thursday, Oct. 9th. Its mastermind is Joss Whedon (The Avengers, Buffy the Vampire Slayer), with Neil Patrick Harris starring as the title character and Nathan Fillion (Castle and Whedon's Firely) as his arch enemy, Captain Hammer.